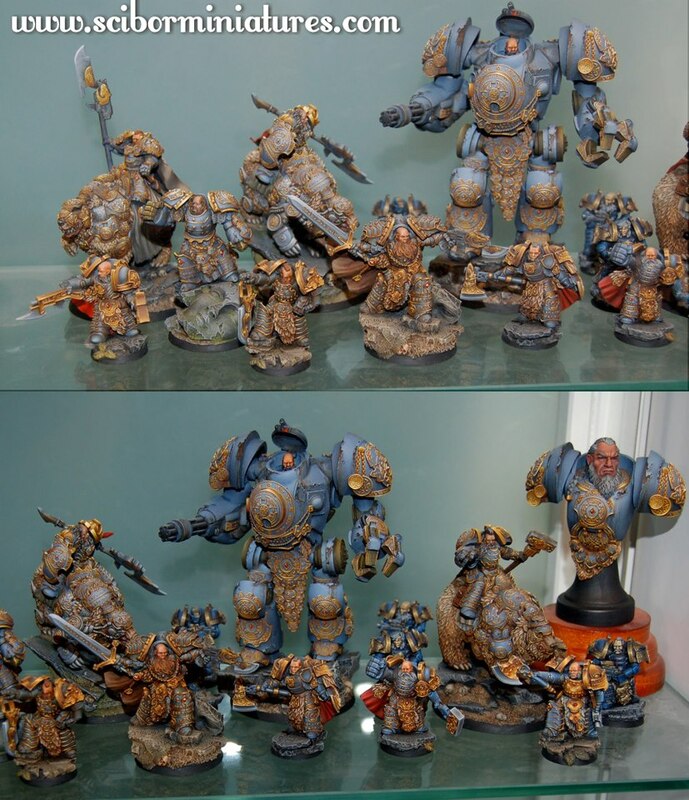 Scibor Monstrous Miniatures is a company that stands out significantly in comparison to other wargames and miniatures manufacturers. Patterns designed by Mr. Scibor Teleszyński are unique and often inspired by specific cultures or monuments of art. 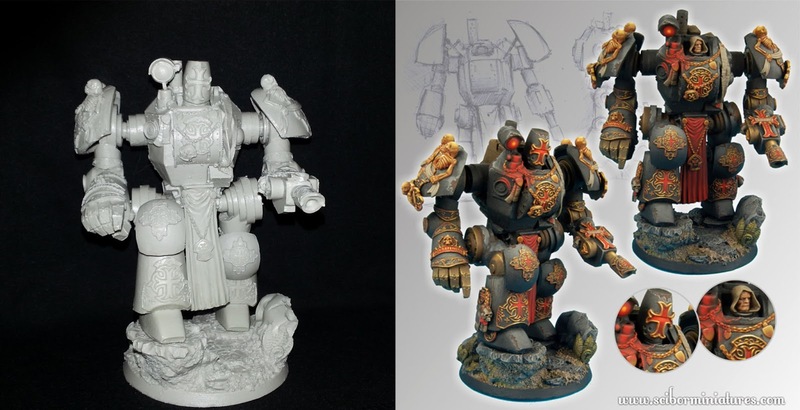 You may also note that due to the uniqueness of the creation process, Scibor products are slightly larger than the standard miniatures for games, such as Warhammer or Confrontation. In the case of Mech Suits the difference is even greater. In most games, there are powerful, larger models, such as dragons or giant war-machines, and usually they are the ones that attract most attention. The equivalents of such special war machines are Mechs Suits from Scibor. 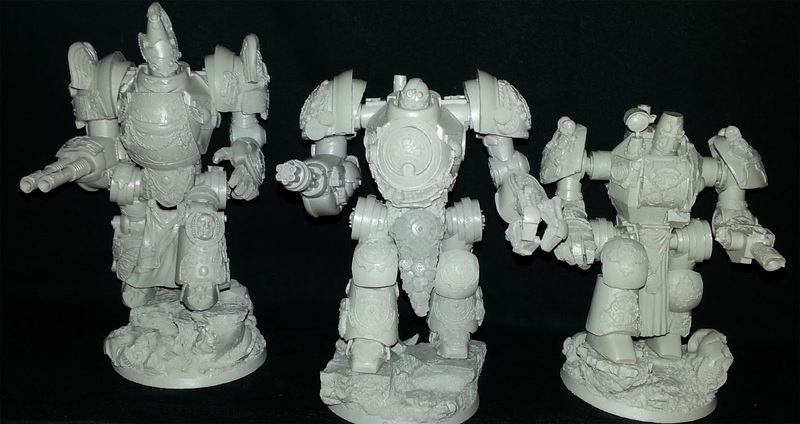 So far there are three variants of the mechs available for sale from Scibor’s store, each belonging to the SF miniatures section. 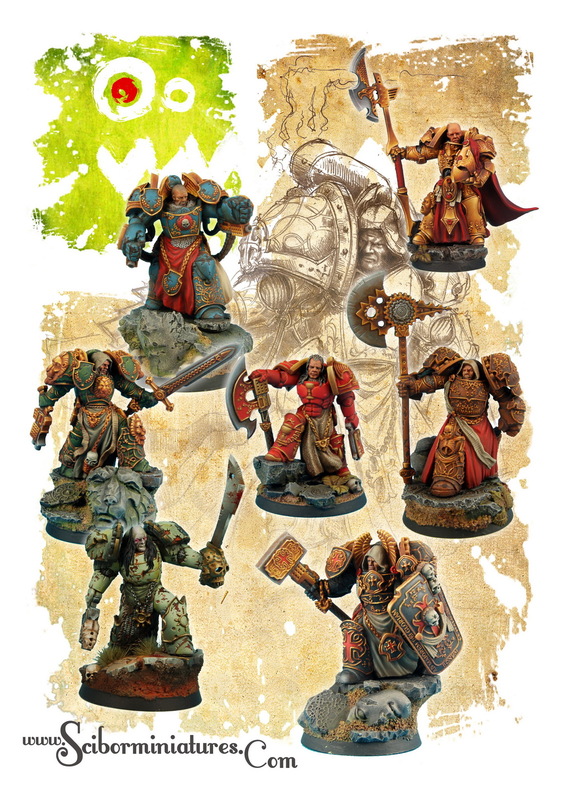 there is the Celtic SF Torin Mech Suit, Roman Gladiator Mech Suit and Templar Paladin Mech Suit. Each of them is a part of an already existing group of miniatures and a great addition to any collector's treasure trove. The first of the described products, the Celtic SF Torin Mech Suit, is interesting not only for those who have already bought figures such as SF Celtic Warrior or Veteran. What strikes us at the first moment about each Mech is their size (over eleven centimeters). 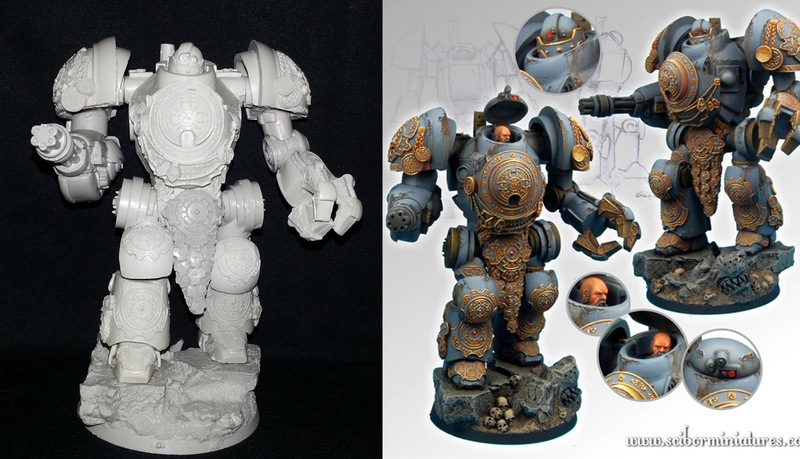 These models could easily serve as a slightly smaller Titans for Warhammer 40,000. They are much larger than the Dreadnought or Wraithlord and when glued on its battlebases, the Mech Suits are even more impressive. Celtic SF Torin Mech Suit is probably one of my favorites, my first thought when I saw it was that it would be perfect for the Space Wolves army. The Armor is covered with runes, wolf themes, skins, fur, runic amulets and the like. What else do you need for the Space Wolves Chapter? Each mech model is composed of several massive main parts: body, legs, shoulders, arms, head (usually in two variants) and the cloth hanging from the belt. Everything is really massive, and therefore, sometimes there are problems with the glue bonding of particular elements. That miniature is relatively heavy and I would recommend gluing it to the battlebase rather quickly. Celtic SF Torin Mech Suit is richly decorated. Things Of note are the runes and Celtic ornaments on the knees, legs, waist, and the central decoration of the breastplate. In addition to large ornaments next to them, there are numerous smaller additions, medallions, charms, and in some parts there is a slight steampunk felling. In addition to the elements mentioned, on the mechanical legs there hang wolf pelts, and wolf fur can be seen at the bottom of the body. The head has two variants, one "knight" helmet (I prefer this option) and the head of a wild warrior. The right hand is like a Gatling gun with is massive and rounded at the bottom. It makes the weapon feel really powerful and dangerous. The right hand is armed with a big hand/power fist and the fingers are covered with runes and carvings. You can see marvelous painting of Celtic SF Torin Mech Suit HERE. The battlebase is very large it has 60-70 millimeters in diameter and almost 30 in hight. Celtic SF Torin Mech Suit's legs are based on two large boulders, under which there is a pile of skulls and a partly-buried large sculpture of a wolf's head. The Knight Templar Mech Suit is slightly different from the other mechs. It is "thinner", wider and a bit more edgy. The arms are more clearly separated from the body than with the Celtic SF Torin Mech Suit. Pauldrons are much less massive, they seem like decorations rather than armor. On the shoulder there are human skeletons that are holding decorative ribbons and under the parchment we can see crest with sign of the cross. What's more, the hands are narrower, have more joints and are not as bulky as in the previously described Mech Suit. The left hand is adorned with a beautiful cross and holds a flat, ornamental laser that has a single barrel, while the right hand is finished with an armored glove. On both hands there are numerous motives of skulls and crosses. On the glove in the Mech's right hand there is also a Fidi Defensor (Defender of faith in Latin) inscription. The body is quite angular and decorated with prayers on parchment, purity seals, chains and medallions suspended from the sign of the cross. On the back there are parts of the powering mechanism, while at the top of the body a little smoke exhaust is placed. At the upper right side of the torso there is a searching spotlight reflector. Head resembles a helmet from the period of the Templar Crusades (alternatively, you can put on a head of a hooded Templar warrior). The legs may seem a bit too massive in comparison with the narrow hands, but this is just the first impression. The legs are fairly simple, more bent than those of the Celtic Mech, clearly showing that the figure is in motion . The Embellishments are quite simple, there is a crest with a cross below the knees and armor. A Garment hangs suspended from the torso and there is a metal pendant on it. If I had to criticize anything here, it is that robe - in my opinion, it is strangely out of place. The last and most recent mech is the Roman Gladiator Mech Suit. It seems to me that it is also the most polished and detailed of those miniatures. In overall appearance it resembles the Celtic SF Torin Mech Suit, it's bulky and heavily ornamented. The Torso again feels more rounded, the whole breast plate is covered with numerous designs. This time, the main recurring motif is the Roman eagle with wings or lightnings. The front armor is still big and decorated with sash and eagle medallions dangling from it. Decorations appear even on the back of the body, including an amazing image of a human head. Mech Suit helmet resembles that of the SF Roman Legionaries from Scibor’s shop and it is really nice. Pauldrons are massive and topped with huge carvings of eagles, which protrude over the armor. Beside the eagles we find many other decorations - among other things, there are numerous purity seals. The Armored shoulder pads are one of my favorite parts of this model. The right hand is again a big gun, similar to that of the Celtic SF Torin Mech Suit. However, it ends with a two-barrel laser rather than a Gattling gun. 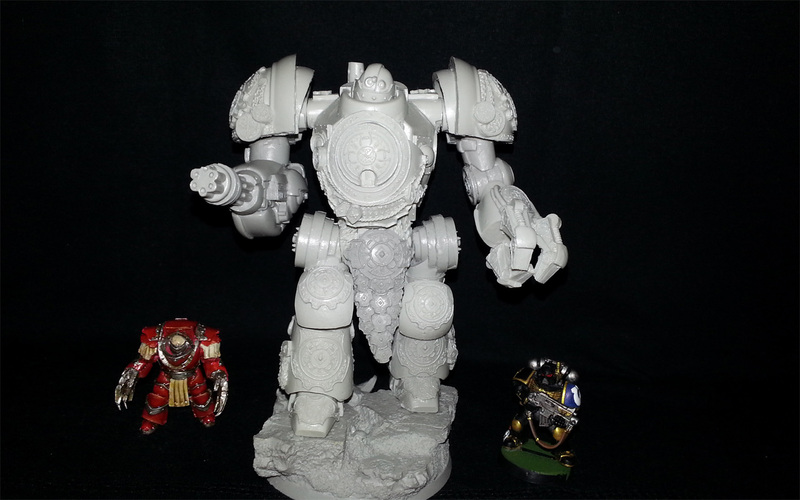 the Left hand is a power fist, but modeled much better than in the Knight Templar Mech Suit (it is better shaped). On the side of the iron fist we can see power supply cables and on the back of his hand there is a beautiful crest. This model is almost baroque in its overall appearance, even its legs are covered almost entirely (including the feet) with ornaments : crystals, seals and a variety of other details. Once again, there are various-sized imperial eagles with the lightning motif. The Elements which occur quite frequently on the legs are stones or gems inside the larger ornamental elements. For the first time a garment hanging from the waist seems to be really thought over, as it really fits. All the three models look great, but each of them takes more work and more cleaning than smaller figures from Sciobr Monstrous Miniatures. Unfortunately, in some places strong dividing lines were visible. In one case, even the leg width was different. These are large models and things like that can happen, you have to take this into account when buying one of the Mech Suits. Little resin errors occur more frequently than in the previously-reviewed products; fortunately, it happens only on smooth surfaces, without damaging any of the decorations, all the errors are also relatively easy to fix. The three Mech Suits show the evolution of the concept and its execution, two of them are similar in overall structure (the Celtic Mech Suit and the Roman Gladiator Mech Suit). The Models are so similar that it would be possible to even swap weapons among them. All three figures have beautifully carved battlebases. However, this has both good and bad sides. Battlebases are really wonderful and they add a lot of charm to each figurine, but because of that those models were carved/set to fit precisely onto a particular stand. In most cases they must have one foot above the other (presented as in move). Despite these minor comments those are amazing miniatures (big badass miniatures). What makes them unique is not only their size, but also their quality. The Price is quite high, but when you think about that it's not much more than you pay for much smaller models (e.g. dreadnoughts). Each Mech Suit will present itself phenomenally both in our domestic exhibitor, and in the midst of your army. It seems to me that the Celtic Suit will fit perfectly into the Space Wolves Chapter, while the other two Mech Suits will fit the Grey Knights army (especially the Templar Mech Suit reminds me of Dreadknight). Mr. Scibor Teleszyński actually said that this project is no at its end and he is planning to create Egyptian and Spartan Mech Suits in the future. Świetne modele, ale bardzo drogie jak na polską kieszeń. Zbieram wilki i kupiłem celtyckiego, nie używam go w grze, ale świetnie wygląda na półce razem z moją armią.